A long drive north to a region dominated by a sleeping giant - Mt Taranaki a dormant volcano. A long drive lay ahead of us today, plus we needed to take care of some house keeping, so we left our coastal parking spot and headed north to Levin then onto the region of Taranaki. Since the day dawned a little drab, we decided to just spend it covering some kilometres so didn't really stop a lot along the way except in the town of Hawera with its historic buildings and water tower. 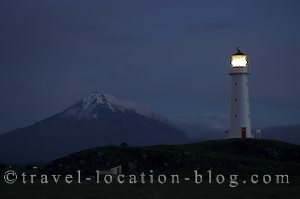 Our destination, we decided en-route, was Cape Egmont - the location of the Cape Egmont Lighthouse. We were delighted to find a superb parking spot right between the coastline and the lighthouse. We even had permission from the farmer whose land it was!! We arrived in plenty of time to settle in, then capture a dramatic sunset out over the Tasman Sea and South Taranaki Bight, as well as in the opposite direction towards the lighthouse which is backdropped by the 2,518 metre high Mt Egmont. The mountain has two names Mt Taranaki which is the original Maori name, and Mt Egmont which is the name Cook chose during one of his explorations. We felt honoured to catch a glimpse of the full mountain since it is most often cloaked in dense cloud.